AcadeCoders will be offering 2 separate course streams this summer. 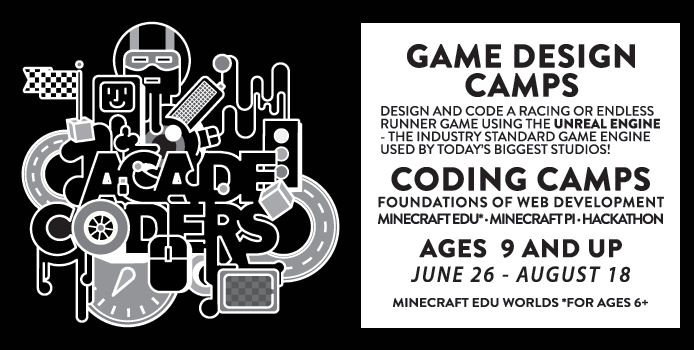 We will be offering AcadeCoders Game Design and Programming along with our original, coding-based AcadeCoders, which will feature web development, Minecraft Pi, and a week of Minecraft EDU. Both streams will run simultaneously. The maximum class size is 12 with a teacher to student ratio of 1:6. For more information regarding the weekly topics and dates, please download the registration forms. AcadeCoders 2017 will challenge campers to design and code their own extreme racing game and/or endless runner game. 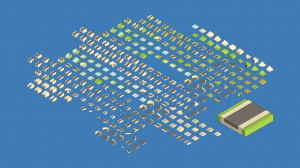 Young coders will learn blueprint (visual scripting) and visual basic, while navigating and leveraging unreal: the industry standard game engine used by today’s biggest studios. unreal engine is an ideal way to gain a practical feel for code, all the while learning an actual industry skill set, yet it is a big, nay, very big, piece of software. That’s why AcadeCoders 2017 is an in-depth camp experience that allows campers to either come in for a week to build a playable prototype, or to come in for several weeks, and build upon their previous knowledge, refine different aspects of their game, and master different aspects of unreal Engine. Download the electronically fillable 2017 AcadeCoders Game Design and Programming Registration form. Minecraft EDU – Due to popular demand, AcadeCoders will be featuring 1 week of Minecraft Edu Worlds as the first session to celebrate the start of summer! Minecraft gives AcadeCoders of all ages the freedom to be creative, pushing their imaginations to the limit and allowing them to be creative and to problem solve in ways not possible in the real world. While having fun, the game engages them in higher-level critical thinking. Minecraft is also a very social game, where AcadeCoders work as a team to overcome challenges. When they work together, they build a positive play climate, learn the benefits of collaboration and organic teamwork. Furthermore, Minecraft Fun Breaks are part of the daily routine for every AcadeCoders session. With the combination of these two disciplines; the AcadeCoders will be able to build a website from scratch with various logic and features. As a bonus, AcadeCoders Weeks 2 and 3 will learn the fundamentals of light, shadow, exposure and composition to take good photos and use Adobe Photoshop to enhance their website’s overall look. Hackathon – The word “hackathon” is a combination of the words “hack” and “marathon”, where “hack” is used in the sense of exploratory computer programming. Hackathon Week will present a daily opportunity for AcadeCoders to work together designing apps to tackling real-life issues. The objective of this session is to boost creativity as well as coding, problem-solving and communication skills and, at the same time, make the world a better place. Download the electronically fillable 2017 AcadeCoders: Web Development, Minecraft Pi, Minecraft EDU Registration Form. No Comments on "AcadeCoders 2017"